Sketch Engine is not a public cloud. Texts you upload and corpora you create will be stored in your personal space in your account. Other users cannot access your texts. You can, however, choose to grant access to other users. An explicit action has to be taken by the user for this to happen. Log in to Sketch Engine (or click Home) and select WebBootCaT. Download the whole website (up to the limit of 1,000 pages maximum). A download of a large website may take longer than the seed word and URL options. Sketch Engine only downloads one page every few seconds to avoid being blocked form access to the website. A download of a 1,000-page site might take about 3 hours (6 hours for trial users). The process runs in the background, you can log out of Sketch Engine or continue using Sketch Engine while the process is running. (4) (if the Seed words option is selected) type between 3 and 20 keywords separated by a white space, enclose phrases in double quotes (20 is recommended, less than 8 might be too low, more than 40 is useless, rare words may produce less but more accurate results). Words do not have to be written in all forms, the basic form, e.g. be, is sufficient. (5) if you cannot think of enough keywords, point Sketch Engine to one or more Wikipedia articles. Sketch Engine will extract terminology from the articles. You can select which terminology should be used as seed words. Tuple is a sequence of seed words submitted to a search engine to find relevant internet pages. the maximum number of tuples (searches) to be sent to the search engine. The limit is 100.
the maximum number of URLs to be retrieved from one search. The limit is 100. Exclude too small or too large files. All downloaded files are cleaned first. This involves removing text unsuitable for a corpus use such as menus, small print, disclaimers, advertisements, consolidating white spaces etc. Provide a list of words which must be included in the texts. Matching is case-sensitive and phrases can be enclosed in quotes e.g. “bread and butter”. Provide a list of keywords which must not appear in a web page to be included in the corpus. The options are analogical to the white list options. Click Next, your seed words will be submitted to the search engine and candidate URLs will be displayed grouped by the query that produced them. You can deselect any of these URLs at this point. Click OK to build the corpus. Sketch Engine will start downloading, cleaning, tokenizing and tagging your corpus. You may have to compile the corpus if you did not select automatic compilation in the first step. Your corpus is now ready to be used. Click Home, go to My corpora and select the corpus to start searching it. If the corpus is small, you can create a bigger corpus by repeating this process as many times as necessary or by uploading your files. How do I decide on the correct parameters for WebBootCaT? As a rule of thumb, do not worry about the advanced settings and use the default settings. Only if the results do not produce the results you need, start looking into the advanced settings. Max tuples (100) is the number of queries (seed word combinations) to be sent to the search engine. Use these maximum values to get as much data as possible. High number of URLs per query can result in a bigger but less relevant corpus because even links found on the 2nd, 3rd and subsequent pages of the search engine results will be included. Finally, you can repeat the same procedure several times to enlarge the corpus. Sketch Engine will make sure no page, text or part of text is included twice (deduplication). The white list keywords can be useful to avoid ambiguity of the seed words, i.e. you can make some of the unambiguous seed words compulsory to make sure the document matches the topic. Black list keywords can also be used to reduce ambiguity (e.g. you might use “party” when collecting a corpus on the environment using seeds which include “green”). It is only necessary to use the whitelist and blacklists if you are getting irrelevant documents, otherwise it is not necessary. How to create a 10-million corpus? You can run WebBootCaT many times to build a bigger corpus. You should aim for 20-60 seeds if that is possible in your domain. You can repeat the process with the same seeds multiple times (there is only a very small probability the same seed tuples will be chosen). You can also split your seeds to sets of 10 seeds and run the tool with each seed set. Please note that you can use multiwords such as “kick the bucket” using the quotes, and also proper names of different kinds. How to limit my corpus to British English or European Portuguese only? Limit the search to only UK domains or the domains of Portugal. Type .uk (.pt) into the site list in the advanced options. How do I get new seed words when I want to repeat the process? To repeat the process with new seed words, use the keyword extraction from the current corpus. you will need to name this part of your corpus and then proceed as normal. You can repeat the process as much as you like. You can see how much data you have at each stage by checking the corpus page. Why are some paragraphs missing? WebBootCat uses an algorithm (jusText). to remove unwanted content such as page navigation, headers, footers, very short paragraphs (=boilerplate) etc. 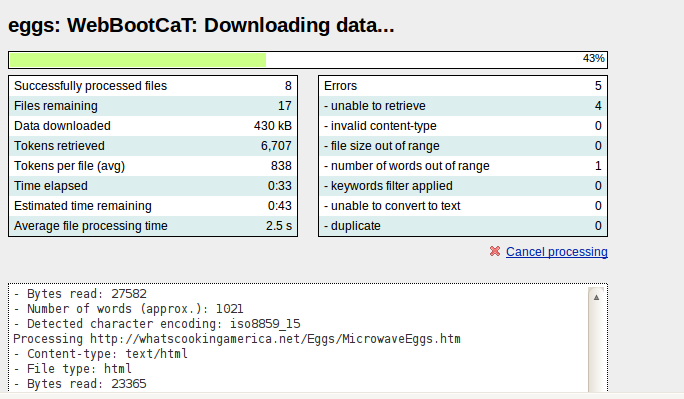 Filtering low quality text from the internet is very difficult to do programmatically. This is why, on very rare occasions, some good content may be removed too by mistake. A tip for downloading text sparse pages (e.g. internet forum): Set Min file size and Min cleaned file size to zero in advanced options. A tool for boilerplate removal is used to extract text in a web page. The tool is likely to ignore short isolated paragraphs which can be the case of some discussions. Corpus can be created from the web even if the language is not supported by Sketch Engine. Select “–other (UTF-8)–” from the language dropdown if your language is not listed. 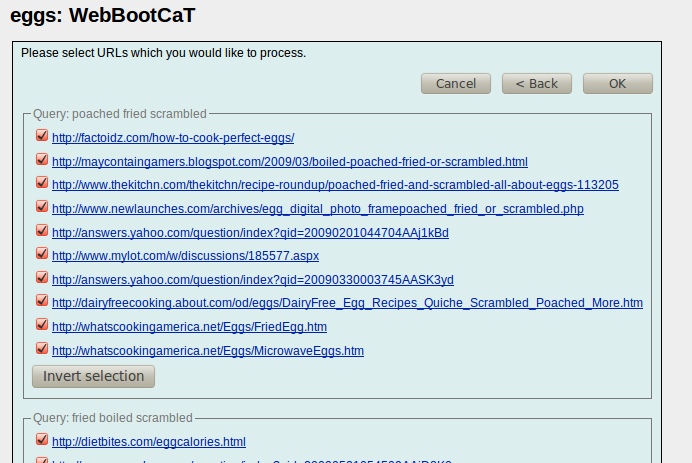 search engine setting will not constrain the search to any language when using WebBootCaT. The Word sketch feature and related functions work depending on user’s definition or you can select the universal generic sketch grammar. A sophisticated deduplication option becomes available if the user decides to manually compile a corpus. This deduplication option has to be manually selected. This deduplication uses the onion deduplication tool. I cannot download a specific website. The internet is a decentralised and constantly changing place, therefore, we cannot guarantee a particular website is downloaded. You can try to use another tool downloading entire websites, e.g. HTTrack, cURL or Wget tool. Also, these alternative tools can help you with gaining texts from password protected web pages. 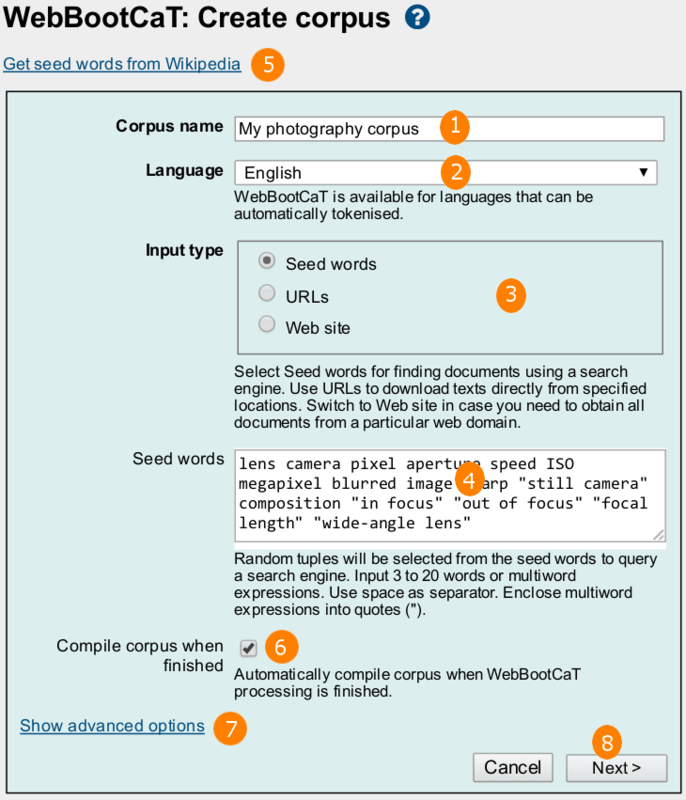 For more information on WBC, please see WebBootCaT: a web tool for instant corpora (2006).